MIDDLE EAST & AFRICA: Around 40GW of new wind power will be installed in the Middle East and Africa (MEA) by 2026, at an average growth rate of 22%, according to new analysis by Make Consulting. The rapid growth of wind in the region will be aided by costs falling around 15% by 2022 caused by good wind resources, greater experience from other regions, and best practices in the value chain, Make said. 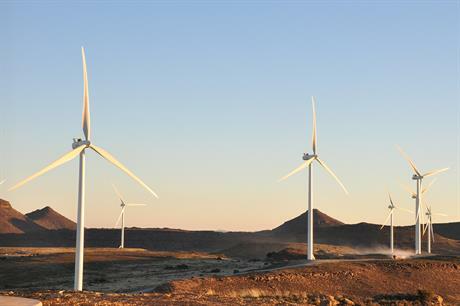 "The implementation of auctions in countries such as South Africa, Egypt, Morocco and UAE has resulted in some of the cheapest bidding prices globally for both wind and solar projects," Make said. The analyst firm said Saudi Arabia, working on its first tender process, could be set to assume a "leadership position" in the Middle East. Africa remains the dominant area in the region, with over 91% of the regions' 4.2GW of capacity installed there, led by South Africa, Morocco and Egypt. South Africa and Morocco alone added 80% of 2016's new capacity, despite the ongoing problems with power purchase agreements in South Africa. However, by 2026, other countries in the region will play an increasing role, Make said, with 80% of MEA countries using wind power. "Although 70% of total new capacity will be added in only seven countries," the firm said.